Hanoi (VNA) – Finance leaders of the Association of Southeast Asian Nations (ASEAN) and Japan, China and the Republic of Korea agreed to enhance regional finance cooperation and support multilateral trade and investment systems. 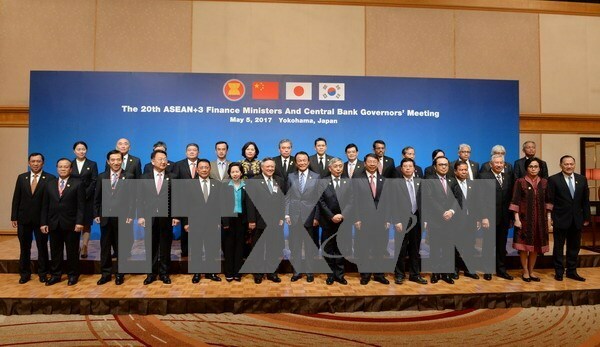 The officials made the decision during the 20th ASEAN+3 Finance Ministers’ and Central Bank Governors’ Meeting held in Yokohama, Japan on May 5. In a joint statement after the meeting, finance leaders agreed to promote sustainable, balanced and inclusive economic growth by deploying all necessary policy tools independently or jointly, including monetary, fiscal policies as well as structural reform. They also stated that the regional economy, while growing relatively fast, still faces downside risks caused by factors, such as protectionism and financial condition tightening. They vowed to support open and rules-based multilateral trade and investment systems, and agreed to enhance the monitoring of capital flows and pay close attention to and address possible risks in the region. The leaders also reaffirmed strengthening the role of the Chiang Mai Initiative Multilateralisation (CMIM) as part of the regional financial safety net and welcomed the fruits achieved in the first joint test run of the CMIM and the International Monetary Fund.